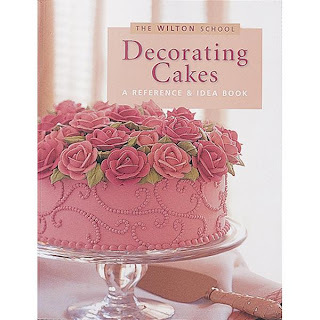 I also bought a great book by Wilton about basic cake decorating. I got some recipes out of it and things were good, but still a lot of problems. This time I did make the cake dough from scratch. It was the Wilton wedding cake recipe. Pretty dry, but really tasty. It is a dense cake and I imagine it would be great for making tall layered cakes. But once again, just a bit too dry for me to really love. I would love to mess with it and try to make it moister because the flavor was to die for!!! Preheat oven to 350°F. Grease bottom of two 8-inch round cake pans and line with waxed paper or parchment paper. Sift together flour, baking powder and salt; set aside. Cream sugar and butter together until light. Add eggs and vanilla to creamed mixture and beat until thoroughly mixed. Add flour mixture to creamed mixture alternately with milk, beating well after each addition. Continue beating one minute. Spread batter evenly in prepared pans. Bake 30 to 35 minutes or until wooden pick inserted in center comes out clean. Cool layers in pans on wire racks 10 minutes. Remove from pans; cool completely. Fill and frost as desired. Cake serves 12. For this cake I cut it into 3 or 4 tiers and just put more frosting in the middle between layers. This was also not that great. It added to the dryness and it made it just too rich. Butter cream on the outside and butter cream in the middle of a dense cake was just not the best thing in the world. I did get to practice my roses though. I used a butter cream recipe from Wilton that had some Crisco in it instead of all butter. I put in almond extract and it was very tasty. The frosting ended up being a little too dry to do the flowers very well. They ended up more like crinkle petal roses, which ended up being pretty cool in the end, but not exactly what I was going for. For Medium Consistency: In large bowl, cream shortening and butter with electric mixer. Add vanilla. Gradually add sugar, one cup at a time, beating well on medium speed. Scrape sides and bottom of bowl often. When all sugar has been mixed in, icing will appear dry. Add milk and beat at medium speed until light and fluffy. Keep bowl covered with a damp cloth until ready to use. For best results, keep icing bowl in refrigerator when not in use. Refrigerated in an airtight container, this icing can be stored 2 weeks. Rewhip before using. Makes: About 3 cups of icing.